You are here: Home > Possible Galaxy S III Device Spotted Hanging In The Wild? Here we go again as the world discovers yet another supposed Galaxy S III device hanging around in the wild and caught on camera. The image was reportedly taken by an individual currently testing the device, though absolutely no details were provided. We do see a classic Samsung design and the shape and size of the device does seem in line with earlier rumors. Previous rumors have indicated the GSIII will feature a home button and a five-row icon display which can be seen above even through the blocked out image. So what makes us think this image is fakery? Well, the overlapped Samsung branding at the top for starters along with the non-parallel display at the top and bottom, and finally the broken blue line above the icons. 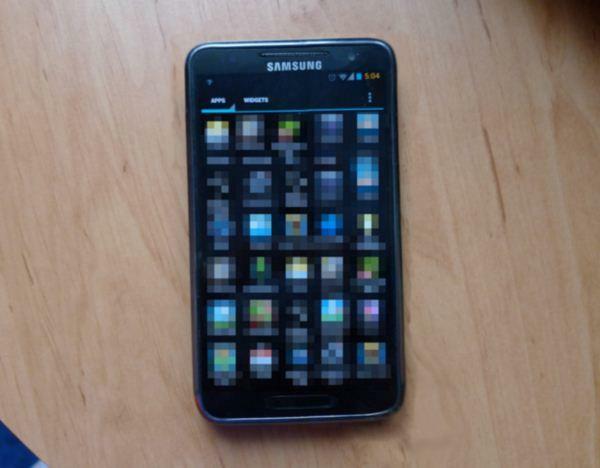 As it stands, we’re decidedly unsure that this image is real and that this device is the now famously faked Galaxy S III. At this point, it doesn’t look like anyone will get a chance to scoop Samsung as we wait for their official announcement and unveiling. Definite fake. Screen overlay was pasted on. I would say “nice try”, but it isn’t. fake for sure but still … who actually believes the Galaxy S III will be any different aesthetically than the ones before it? that’s the problem HTC is running into now .. to many lookalike phones. There’s no way Samsung reverted back to the original Galaxy S’ styling. It may not be fake but that surely isn’t the final build. Yep. Gotta hope they will take a few dares on the design this time around. The one in the picture looks too bland. Is there an official date set for the next Samsung event? IF this is it I’ll Pass. Doesn’t look like anything special to me. TmoNews —> Why do you keep posting these articles….SIGH!!!! Sorry Dave, the phone still look’s like crap. They need to come up with a better design from the outside. Thats an original galaxy s with the button photo shopped how does nobody see that? That’s how it looks to me too. That looks like a real 3 dollar bill. I’m going to have to ask you to stop posting these until there’s a some good hard evidence mmmmmkkkkayyyyy? Greaaaaaat….. Sorry, the cover sheet on my TPS report says I have to post these. They worry about the next device before taking care of the current device, such as updating to the latest operating system. Gingerbread is fine right now but this new device will be out soon and we are still running the older version. The marketing team at Samsung knows this and hopes people buy the latest device (understandable), however it gives a bad taste when you feel that they are not taking care of their current/past customers. It’s about service folks when you are a company. I think Sammy already put out ICS for SGSII? Probably it’s just carriers making sure their bloatware all works right that’s holding up individual models at this point. I’m sure that things like wifi calling are holding up ICS for T-Mo. Plus, they are probably trying to find a way to prevent os from rooting and getting tethering for free so easily this time around. Some things look legit and some questionable…but the overall shape looks like what i expect to see. A large screen device with little bezel and reduced space at the top n bottom, a more elongated Home button. The obscured icons on the screens makes it questionable but i will be expecting to see a GS3 device close to the image above. Someone please give us a little glimpse of the real deal and spec sheet…it is time for a true blurry cam image of this elusive monster. I wish Samsung would just go ahead and announce the damn SGS 3 already!! Only device that will make me give up my GNexus! Hopefully they will announce it soon! Why do so many things on this seem crooked in relation to each other? Speaker grill to the top edge, icon lines to the side edges, for example. Is it a bad photoshop or an optical illusion? And along the right edge, the grain of the wood seems like it’s not quite right. Anyone noticed that the time is in orange while the rest of the notication bar is in blue? Which tells me that this is a custom rom. I call totally fake more so than photoshop. There’s absolutely zero news here. Why bother posting this? Honestly, don’t read it. If you don’t care for it, come back and read the news that does matter to you. I know this is hard for everyone to grasp, but there isn’t 365 days worth of T-Mobile specific news, so sometimes we stretch the boundaries and since this size does specialize in leaks and rumors, this is a possible leak. So we’re posting it. Combating ignorance one post at a time…GO DAVID! With all due respect, you don’t need to reply to people who complain about what you post. It’s your blog and you may post whatever the heck you feel like. They can go read something else on another blog. Android, Apple or T-Mobile related new are all valid to me. It’s not like there’s much news about T-Mobile out there anyway. David, you do good work. This is the site I visit to read up on TMO news, rumors and information. And you are are not the only one to post this image. BGR and Engadget also posted the photo. I just find it frustrating that some hack can photoshop an alleged image of the SGS 3 and get his rocks off by having his “leak” published all over the internet. Guess I’m just venting my frustration. Sorry! I’ve been following TMO News for years and you really do keep on getting better. I know, but once in a blue moon, those hacks we don’t believe have any possibility of actually possessing the phone, actually have it. It’s those times that make us regret not posting stuff like this. Yeah, this image is probably a big fake, but one of them is bound to be legit and it’ll be just our luck not to post the one that is. I appreciate this site’s obvious skepticism on anything that doesn’t look legit. each device has numbers engraved on it so in order for people not to get fired over things like this they PS the crap out of it. Hey David your doing an awesome job maintaining this site. I want a site that posts rumors, news, deals, specials, etc. It’s good to be back lol. Don’t listen to idiots. I think the biggest thing giving this away as a fake is the fact that everything that is supposed be on the screen is crooked. Look at the like and continure to look down. You can see the unevenness of the phone. I meant to say look at the line. The device is running stock Android ICS. Samsung wouldnt do that, it would be running TouchWiz. supposedly test units are also sent out without TouchWiz. Looks like the Galaxy S II HD LTE to me. Went from a sensation to a galaxy S2…Hated it! Down to that Bluish/Greenish Super Amoled BS azz screen..Just my humble opinion. Looks like the Sammy Vibrant with that chrome outer ring. Looks like the Galaxy Note w/o TouchWiz. Hey david don’t mean to sound like a douche but that pos actually has 6 rows of apps and 5 columns. Oh and not calling it a pos cause i hate android or samsung, but because it’s really hard to look at the picture and not laugh at the horrible photoshop skills. What is the grey ghost face looking icon for a data symbol? The top menu reminds me so much of the Sidekick 4G… why would they use that UI here? I just saw one the other day. If this isn’t it. its a close approximation. They are being tested on Tmo’s network as we speak, but this is a generic phone. it has no tmo tags on it whatsoever, so it’s probably not the final product which means we are probably still months away from a launch date.